STRATOLINER BLACK STETSON FUR FELT WITH BOUND EDGE. STRATOLINER CARIBOU STETSON FUR FELT WITH BOUND EDGE. We’re a specialty hat store dealing in vintage, classic, and new headwear for men and women. Imported wool, straw, and genuine Panama. 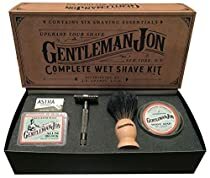 "Gentleman Jon Wet Shave" Kit For Him or Dad.